One might call Javion Joyner a Renaissance man. He certainly is no stranger to the term. “Yeah, I’ve gotten that before,” laughed the Central Valley High School senior, who holds leadership roles in DECA and Future Business Leaders of America, while participating in National Honor Society and orchestra. 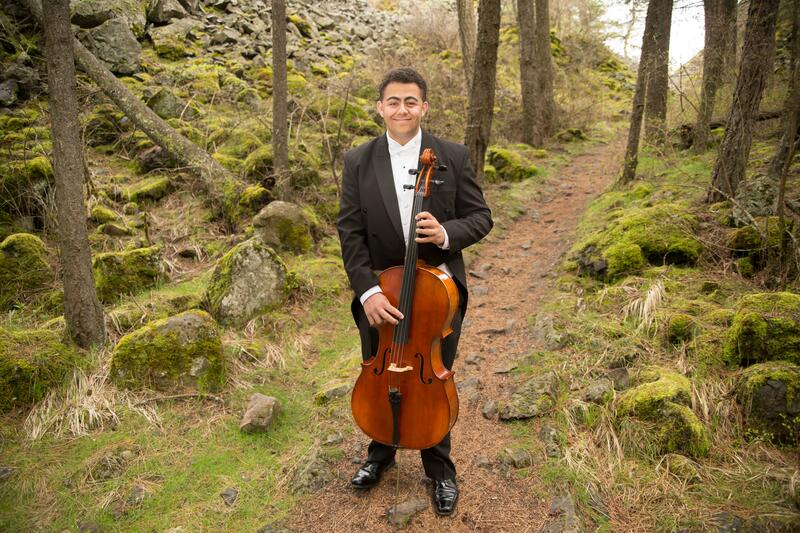 He also teaches cello and bass to younger students and is an AP scholar, Spokane Scholar Award Recipient for math, and a National Merit Scholarship Finalist – all while maintaining a 4.0 GPA. But Joyner’s participation in all of these groups and activities was more than just an addition to his resume. He saw them as chances to grow as a person. Holding leadership positions, such as being president of the school’s FBLA chapter and vice president of DECA, has been an important experience for Joyner as well. He attributed much of his growth in confidence to becoming a leader in both. Asked about his passions, analytics and statistics came into Joyner’s mind, but they were clearly just two of many interests. And Joyner’s creativity is on full display when it comes to his passion for music. He has been playing individually and in orchestra for several years, and has been coaching bass and cello after school to younger students for more than three years. He has found that he still reaps the benefits of playing every day. He also attributes playing in orchestra with providing him a much-needed support system in tough times. “There’s a group chat I can text to vent about my emotions,” he added with a laugh. Business and music are only a couple of areas that he is passionate about. He also has an interest in politics, the environment, the future of education, and economic empowerment, to name a few. Joyner plans to major in economics at the University of Pennsylvania with a concentration in business analytics, and was selected for the Joseph Wharton Scholars program, which will allow him to take honors-level courses in liberal arts as he earns his undergraduate degree. He sees himself working as a consultant to help businesses improve their practices and policies. But to Joyner, beyond all his commitments and passions, there is no higher priority than serving others. “What genuinely sets Javion apart is his desire to leave a lasting impact and raise the level of excellence in both himself and his peers,” Barnhart wrote in a letter of recommendation. Through FBLA and DECA, Joyner has volunteered for Crosswalk and March of Dimes, two charities in the Spokane area. He described it as being more a necessity than a choice. Despite the variety of interests and passions he pursues, Joyner has his priorities. He doesn’t mince words when it comes to what matters most to him. Connor Gilbert is a student at Gonzaga University. Published: May 31, 2018, 6 a.m.